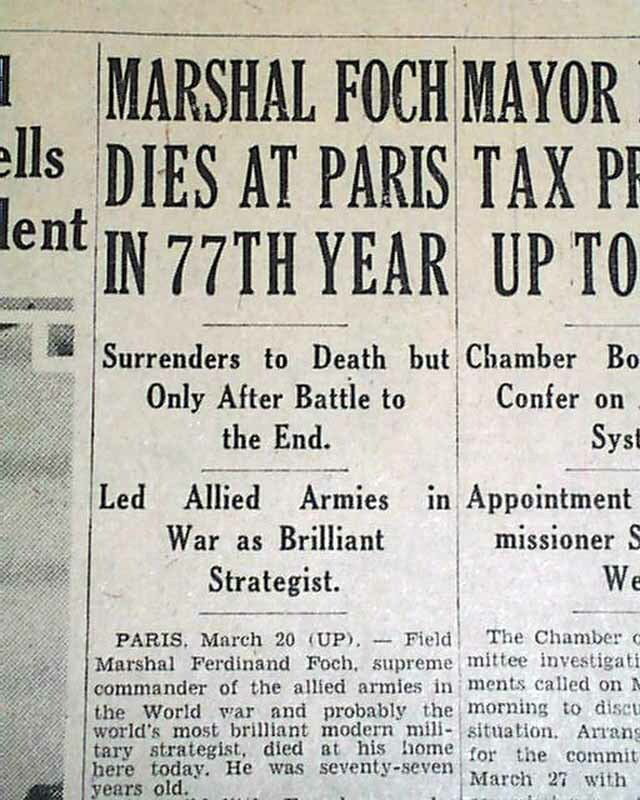 This 30 page newspaper has one column headline on the front page: "MARSHAL FOCH DIES AT PARIS IN 77TH YEAR", "Surrenders to Death but Only After Battle to the End", "Led Allied Armies in War as Brilliant Strategist". 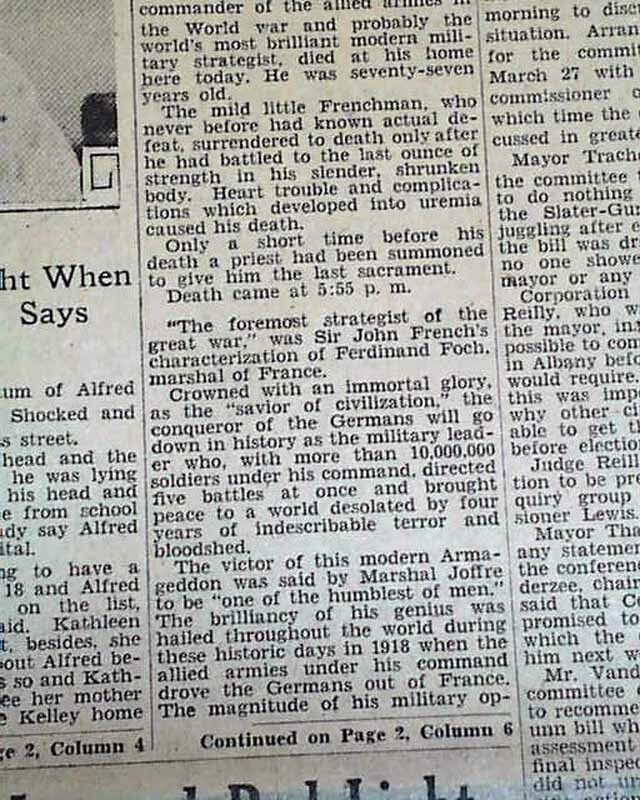 1st report coverage on the death of General Ferdinand Foch, key figure in the 1918 World War I armistice. 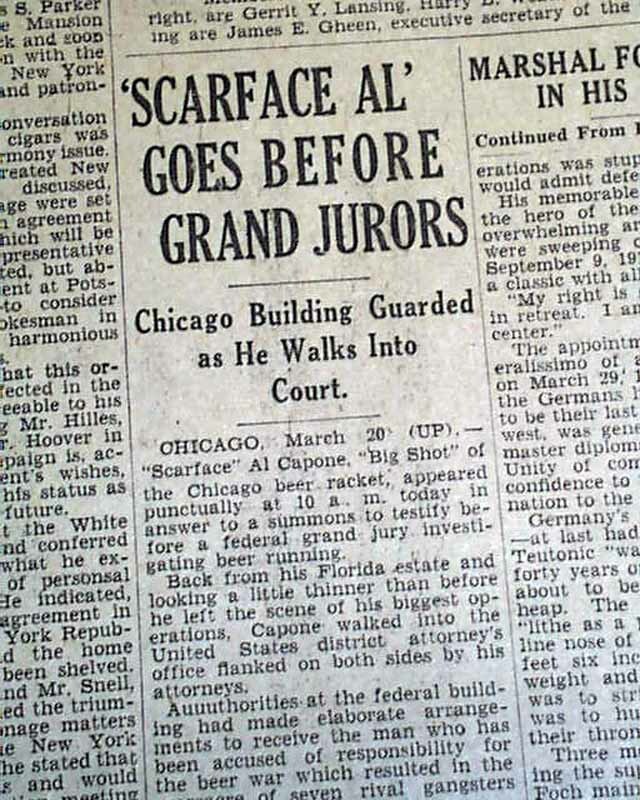 Also a page two headline: "'SCARFACE AL' GOES BEFORE GRAND JURORS"
Other news, sports and advertisements of the day. 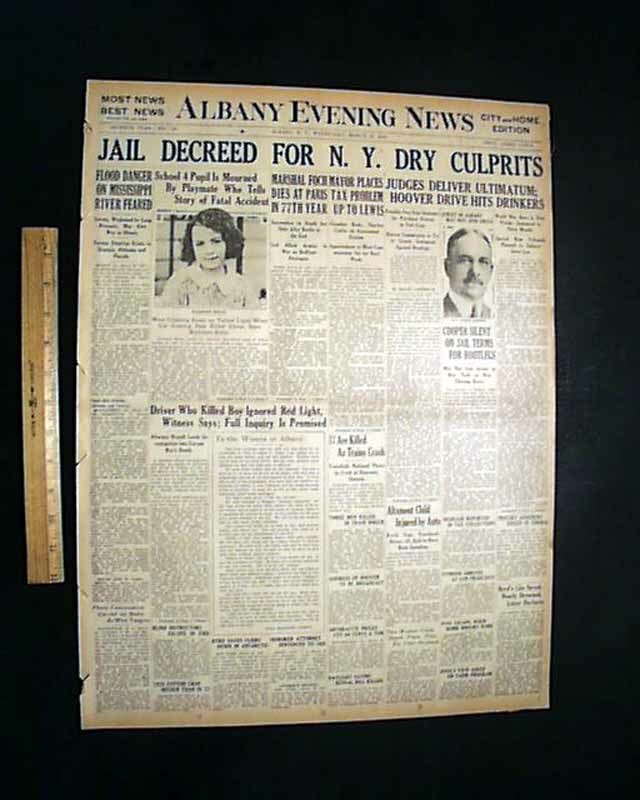 A little margin wear, otherwise good. wikipedia notes: Ferdinand Foch (2 October 1851 – 20 March 1929) was a French soldier, military theorist, and writer credited with possessing "the most original and subtle mind in the French army" in the early 20th century. He served as general in the French army during World War I and was made Marshal of France in its final year: 1918. 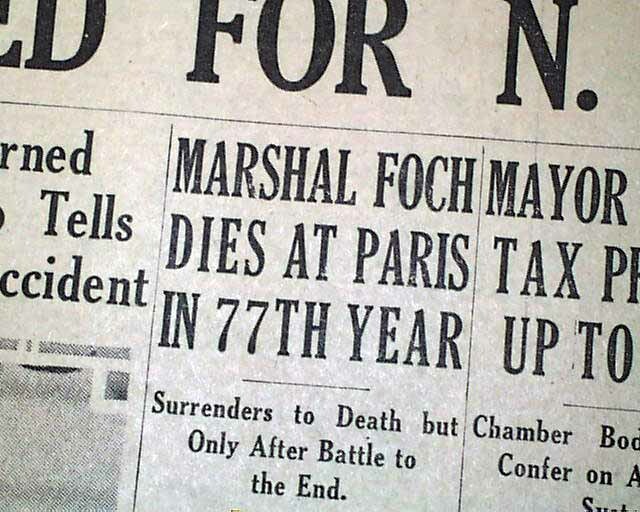 Shortly after the start of the Spring Offensive, Germany's final attempt to win the war, Foch was chosen as supreme commander of the Allied armies, a position that he held until 11 November 1918, when he accepted the German request for an armistice. 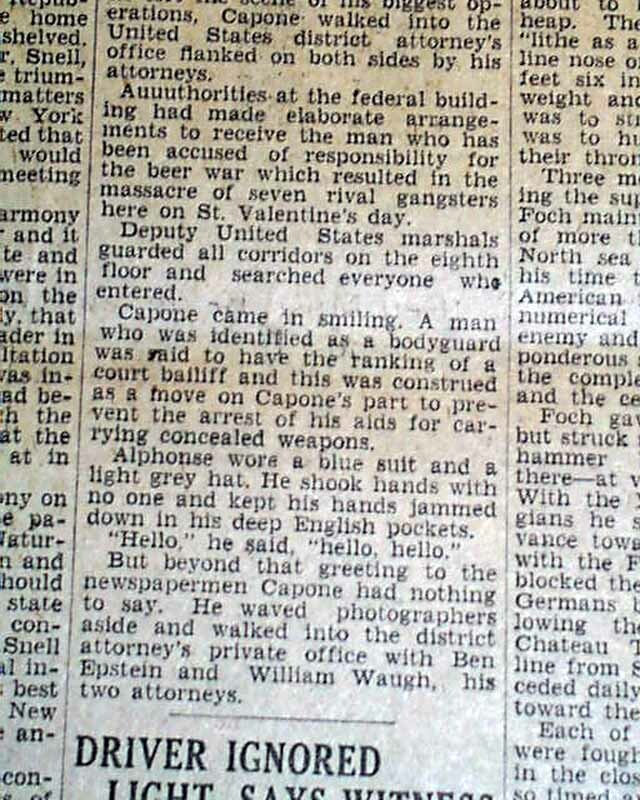 In 1923 he was made Marshal of Poland.